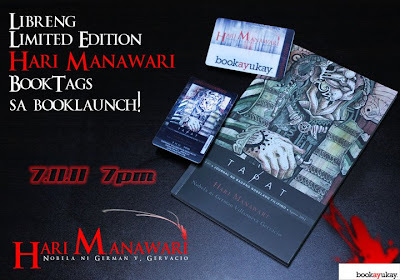 German Gervasio's first novel, Hari Manawari will be launched on July 11, 2011 at 7pm at Bookay-ukay Bookstore #55 Maginhawa St., UP Village in Diliman, Quezon City. Part of the Tapat Journal series, Hari Manawari is edited by Dr. Edgar Calabia Samar; illustration by Rai Cruz. Included also in the book are: forum on the novels of Jun Cruz Reyes (Tutubi, Tutubi, 'Wag Kang Magpahuli sa Mamang Salbahe, Etsa-puwera) and interview with Gen Asenjo (Lumbay ng Dila). Anong masasabi ng iba sa Hari Manawari?